Inder Loves Folk Art: Holiday Sewing, Part 2. Hi everyone! It's chilly here in Oakland! Not by Midwestern or East Coast standards, of course, but since our house is uninsulated and has inadequate heat, when it gets moderately cool outside, it's pretty much the same temperature inside. It's kind of like camping. It's freezing cold in the morning, warms up slowly, and the kids and I tend to spend a lot of time in the warmest room in the house, our dining room (where we do pretty much everything except dine, including sew, play, and work at the computer). I complain about this every year, and I know y'all would feel deprived if you didn't have me to laugh at and roll your eyes at; I'm happy to oblige. You are welcome. As everywhere in the Northern hemisphere, the light is also fading, big time, as we approach the winter solstice, so please forgive the not-so-great photos in this blog post. My flash isn't working, so in the absence of good natural light, I present you with golden-y, somewhat blurry photos. The golden tone actually makes my house seem quite warm, which is lovely. 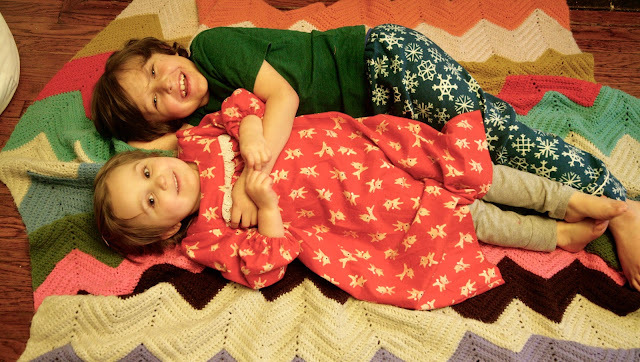 I haven't adopted making Christmas PJs as a tradition (at least, yet) as some families have. I am much more haphazard. I did it for Joe five years ago, then took a long break. 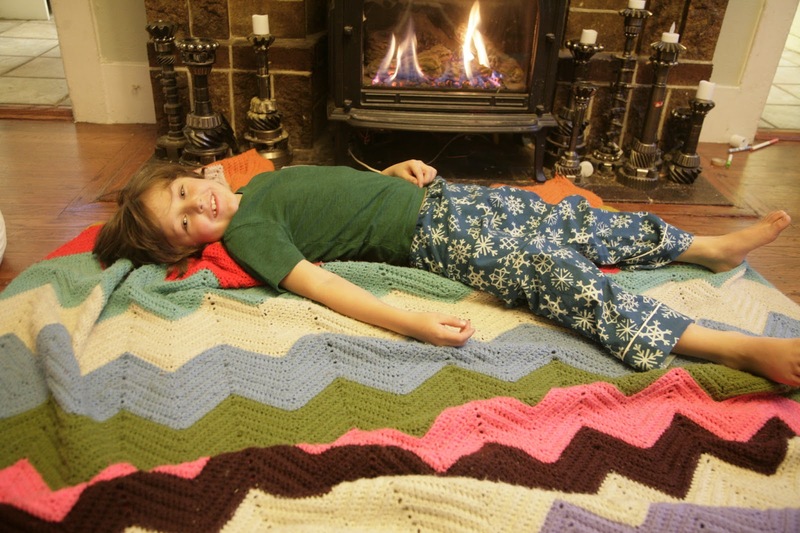 Last year I made PJ pants for Joe on time but then waited six months to finish Maggie's pants. Neither of them were Christmas themed, and I never blogged them. So I don't think we can call this a tradition. That said, I always love seeing the posts start to show up in my blog feed in the week before Christmas. Seeing the girls in their pretty nightgowns and everyone looking so cozy and expectant! It's lovely. Some of my friends do this on an epic scale, for, like, TONS of kids! (I'm looking at you, Rachel.) I only have two kids, and making pajamas for them while juggling other holiday obligations seems like an awful lot of work! 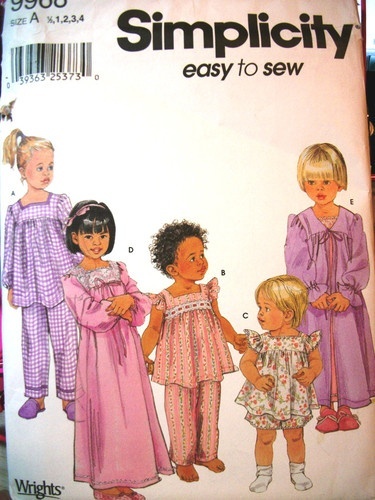 But when I found a perfect used nightgown pattern, Simplicity 9968, at the East Bay Depot for Creative Reuse this year, in Maggie's size (actually even better than her size, since I never know what her size will be these days, but a range of sizes! ), it seemed meant to be. I love old school nightgown patterns, but I've noticed that many have very high necklines, which my kids won't tolerate. They take after their mother in that respect - I hate anything touching my neck! So one of the first things I noticed about this ideal nightie pattern was the square neckline. Perfecto! When I went on a Cotton + Steel Garland buying spree for my tree skirt, I obviously had to buy some yardage in the brushed cotton substrate, right? I let the kids pick which fabrics they wanted for their PJs - Joe gravitated immediately to the blue snowflakes. I admit, I hoped Maggie would choose the red snowflakes, so the kids would be really matchy, and I steered her in that direction, but nope. She wanted the adorable little reindeers. Little Rudolphs (but the noses are more pink than red, to contrast with the red background - so we decided to call this particular reindeer "Rudolpha the Pink-Nosed Reindeer"). 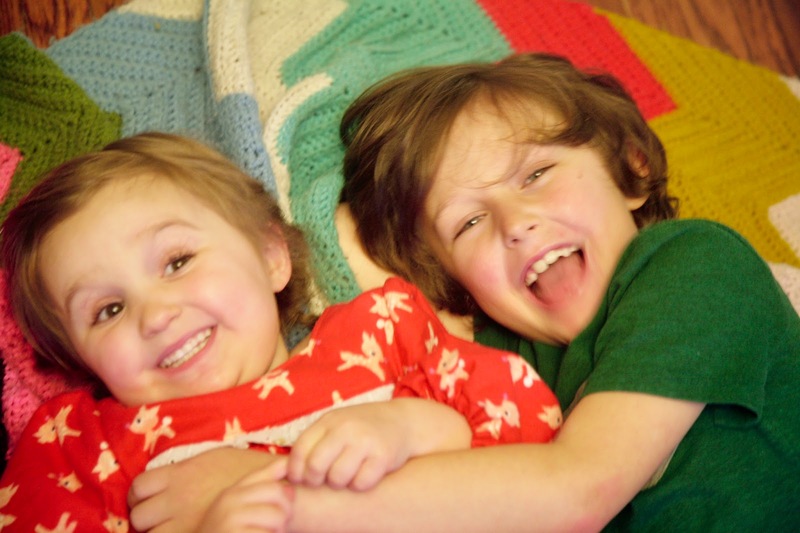 Who could resist clothing these two in warm and cozy flannel, right? They do bicker and fight some, like all siblings, but the love between them is so strong, too. Okay, right, sewing! This is such a great pattern! I made version D, a long nightie with long sleeves. Based on Maggie's measurements, I cut out a size 2, but with extra length in the skirt and sleeves (about 4 inches in the hem, some came out in the hemming; about 2 inches in the sleeves, and I used it!). I tried it on Maggie before hemming to get the lengths right and it worked out perfectly. The sleeves are a bit long, but because they are gathered at the wrists, she can grow into them. The hem is deep and can be let out. Hopefully this nightgown will last at least the next year. This nightie was so fun and fast to make! Nothing complicated here, just a really good, satisfying make. I ended up making just a pair of PJ pants for Joe. 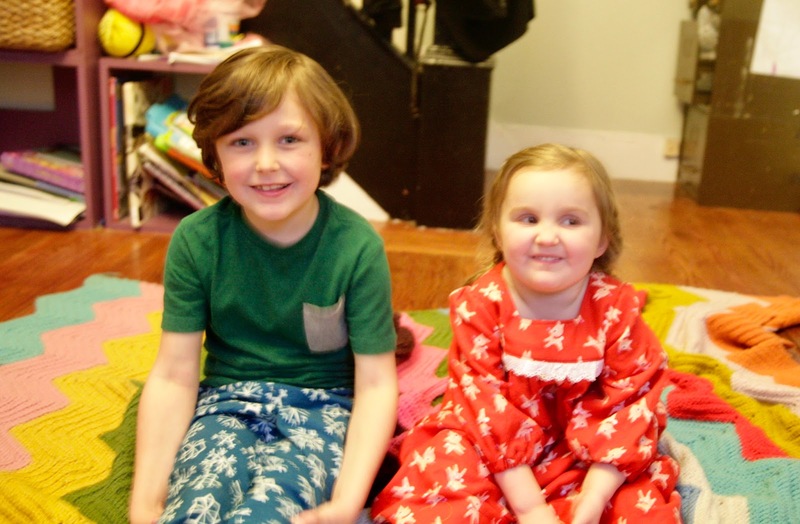 These are the Oliver + S Sleepover Pajamas, just the pants. I'd love to make Joe a full set of pajamas some day, but I didn't have enough time or fabric to do it this time, and I know he'll get the most use out of the pants, so here we are. Cute pajama pants! 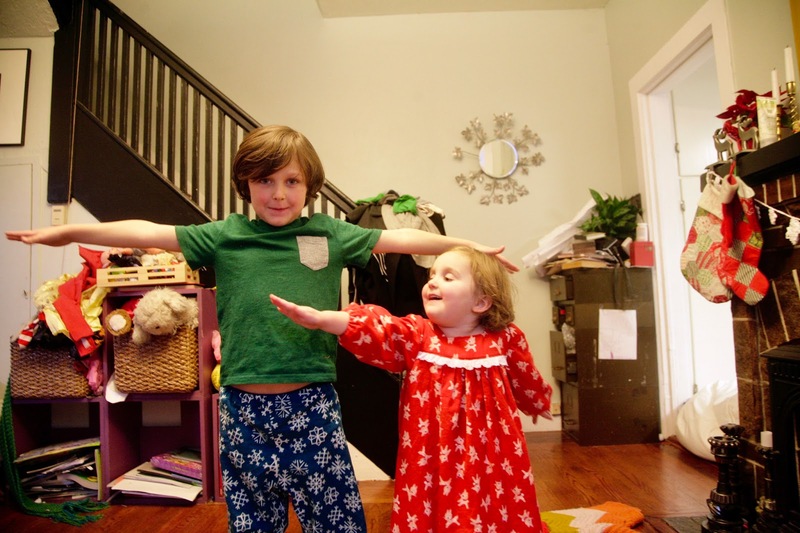 The Sleepover pants have no side seams, a separate waistband, and cute cuffs. I used the same fabric throughout, but added a little white piping on the cuffs of the pants. This is another super easy, fun, and cute pattern! I know this won't be the last pair of pajama pants I make for Joe using this pattern. I am currently reading Ursula K. LeGuin's Catwings to the kids and it has really captured their imaginations! They spend the better part of the day pretending to be kitty cats - who fly! 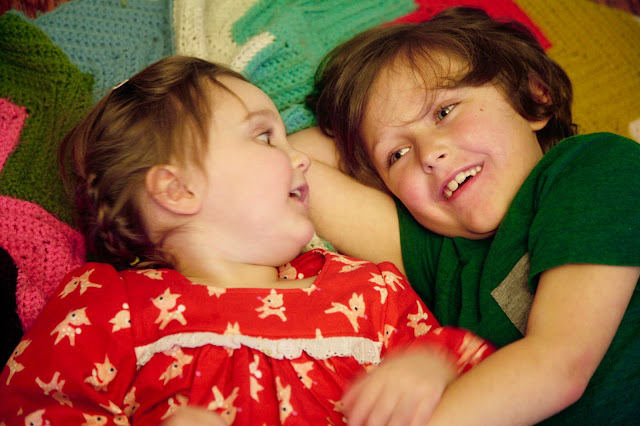 It is such a great series: it has enchanted both my children, and if I'm honest, me too! I will be sorry to finish it. On the practical side, this has been one of my biggest wins with the kids in recent months - three days have gone by, and they are still wearing their flannel pajamas! Maggie had to be talked into taking her nightie off for a brief wash after she spilled something on it. The house is cold, and warm flannel helps! 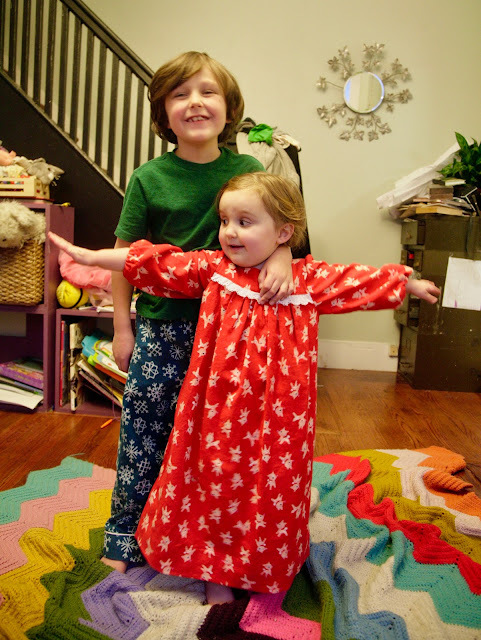 Do you sew pajamas for your kids for Christmas? What are you reading to your children (or what were your favorite picture books when you were a kid)? Oh my goodness Inder! These pajamas are so so good! 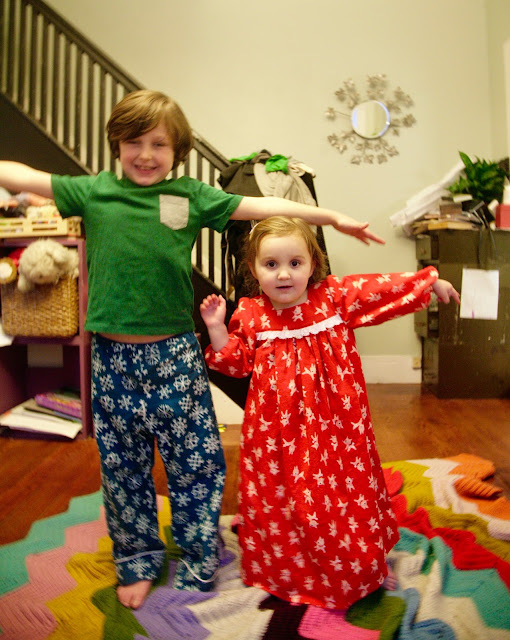 I love them and kind of have Christmas pajama envy! :) The piping on Joe's pants is perfect. And I think Maggie made the right call with the reindeer. It does not get cuter than that! I also LOVE the style of that nightgown! It's so adorable and nostalgic and I love how you added the lace trim! Also thanks for mentioning my pajamas. Haha! That made me smile! So usually, I make the nightgowns and Jude's pajamas when Dan is off of work. And then I use it as sort of a teacher in-service where I binge listen to education podcasts/audios, get ideas for my next semester of homeschool, and have some uninterrupted time to myself. And he watches the kids. But this year, because we got sick and because of the timing of Christmas and how that affected Dan's work and the kids' school schedules, I have been sewing Christmas pjs all-month-long. I'm kind of tired of it. Next year I think I need to find a middle ground between the last minute push to the finish line and sewing pajamas for a month! But I know they get worn all year long so it's worth it. 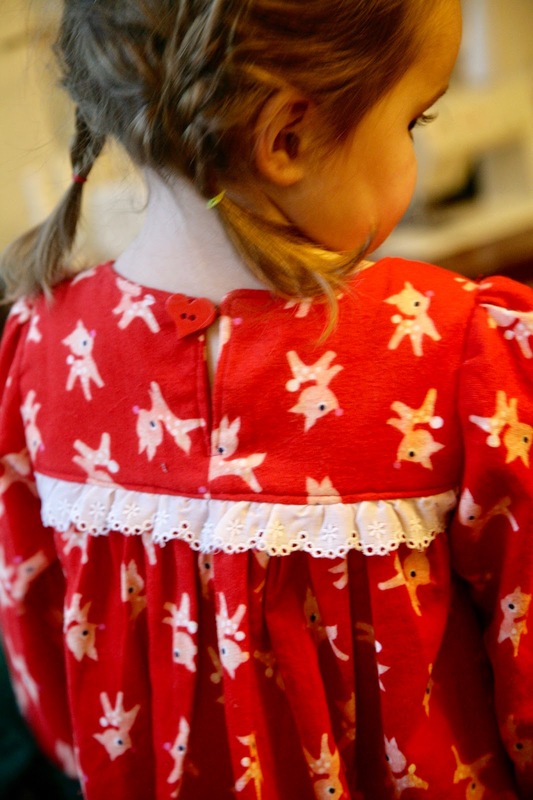 Actually, most of my kids need new sleepwear but I have been very selfish with my newly reclaimed sewing time and am currently only making things for me. Sorry kids. Wishing you a very happy and safe Christmas . very selfish with my newly reclaimed sewing time and am currently only making things for me..